The 2018 SEBA Atlanta College Showcase took place this past Saturday on the campus of Oglethorpe University in Atlanta. 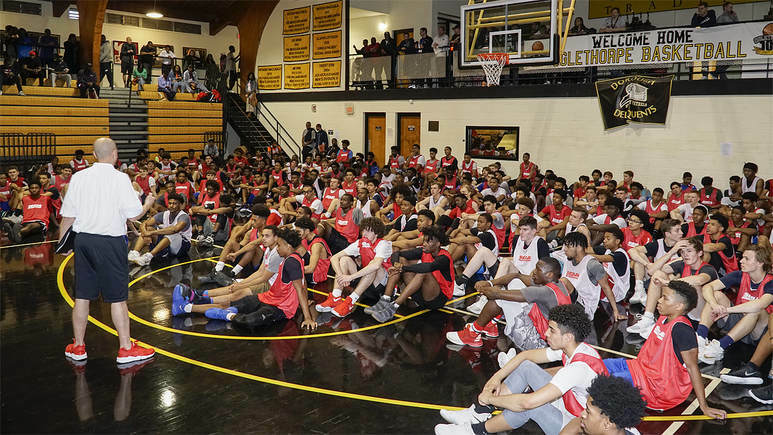 This 13th annual exposure event featured a full capacity roster of 220 prospects. 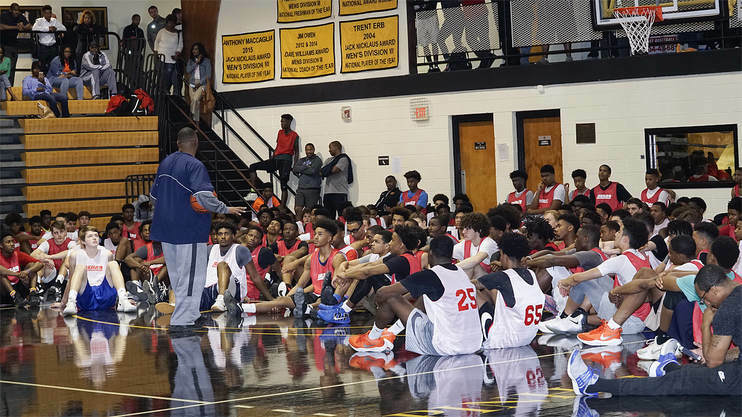 The prospects represented many high school programs from all parts of Georgia, as well as from the states of Florida, Tennessee, Alabama, South Carolina, North Carolina, New Jersey, and Illinois. 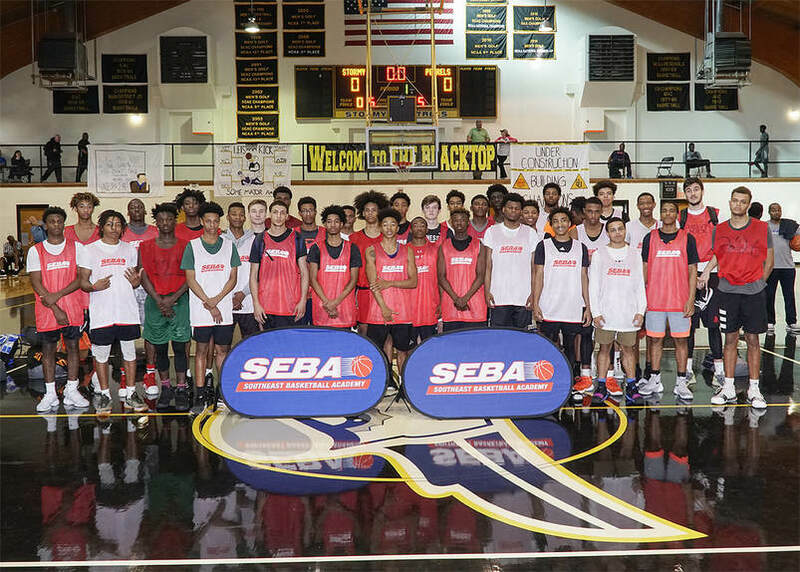 The Showcase continued the SEBA tradition of providing excellent exposure to all of the participants, as over 45+ College Coaches representing Thirty-four (34) College Programs were in attendance to evaluate the talent on hand. Several Regional scouting publications were also on hand to cover the event. ​The Camp consisted of a complete day of instruction, inspiration, competition, and exposure. During the morning session, the players had the opportunity to participate in a circuit of skills stations conducted by some of the state’s top high school, travel ball, and skill development coaches. Following the morning station, the players were treated to a super passionate and inspirational speech from Coach Courtney Brooks. 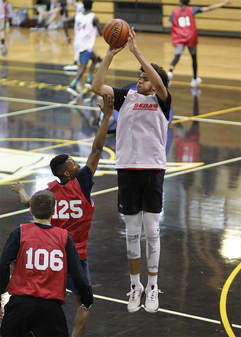 Fresh off the inspiration, the players moved into 5-on-5 play, where they competed in three (3) full-court games with their respective camp team throughout the afternoon and early evening. 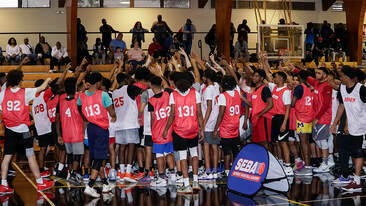 The event concluded with a highly competitive "Top 40" All-Star Game which was well played and a complimentary conclusion to a highly successful event. Good looking guard prospect who shined bright with his play. Is an excellent slasher with athleticism; repeatedly attacked the hoop for buckets. Thrives on the break and had several impressive above the rim finishes. While at his best when taking ball to the rim, he displayed a very capable three point shot. Was named 1st Team All-Region while averaging 21 ppg for Tri-Cities team that advanced to Elite 8. Is going to be an excellent player for a program at the College level. Highly athletic forward with great length; had a very impressive showing. Showed excellent bounce with numerous dunks that lit up the gym. 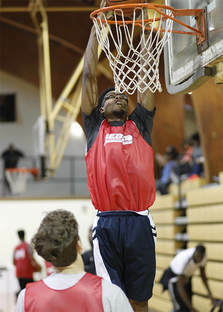 Was in attack mode throughout camp, attacking the rim and crashing the boards. Played with a lot of desire and hustle, he never stopped moving and was willing to scrap for putbacks and tip-outs. Defensively, he provided good help defense and swatted away a number of shots from opponents. Player with excellent upside and future. Was one of the Camp’s top offensive players and impressed many of the coaches and scouts in attendance with his ability to put up points. He successfully scored at the rim, mid-range, and beyond the arc. Has the ability to create for himself off the dribble and score in bunches. Plays with good energy, court presence, and seemed to always be around the basketball on both ends of the floor. His on court skill combined with his stellar academic credentials will make him a sought after prospect this Spring. Excellent athlete and leaper; Jackson plays at one speed and that is full force. He is all over the court and plays with a great motor. 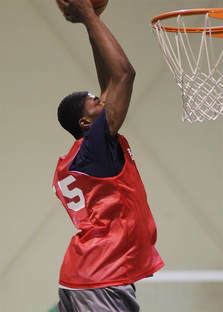 A tremendous finisher, he had one of the camp’s top highlight plays with a soaring dunk over 6’ 7 defender. He is excellent in transition and highly effective in half court play around the rim and in mid-range. Very good rebounder and rim protector for his size. Plays like a Warrior and loves to compete. After a standout Senior season at Kell this past year; Jahwan camp into camp looking to make an good impression with College Coaches…and that he did. The lightning quick point guard played extremely well on both ends of the floor in 5-on-5 play. Whether it was attacking the rim, dropping assists to teammates for easy scores, knocking down threes, or playing excellent on-ball defense, he did it all. Most impressive is his leadership and visible passion for playing the game. Carries a 3.7 GPA and will be a steal for program needing a high impact floor general. 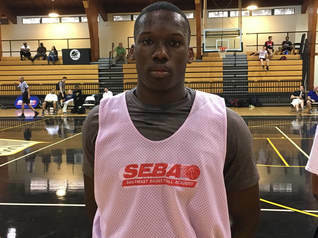 Versatile forward who has a very good showing at camp. Is comfortable posting up and scoring on the low block; but also has the ability to step out and shoot the outside jumper…which he converted with high accuracy. He is effective in a pick-n-roll situations; powers thru contact around the rim. Has good post moves and footwork. Effective defensive rebounder and solid interior defender. All in all, an attractive prospect who saw his stock rise with his strong play throughout the camp. 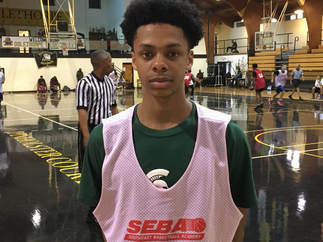 Talented and long combo guard out of Augusta, Tim exhibited a very well rounded skill set. He is a good facilitator and distributor; creating easy buckets for teammates. He takes the ball to the rim well, and also displayed an accurate three point shot. Has good defensive versatility and is able to match up with quick guards and bigger forwards. Game should translate well to next level. Was 1st Team All-region and 2nd Team All-State while leading Glen Hills to State Final Four. Very physically strong wing who can really score the basketball. He was a tough matchup for opposing defenders, using his power game in the paint to overwhelm opponents and knocking down a good number of outside shots. He is very effective off the dribble and pulling up for jumpers. He handles the ball really well for his size and initiates the fast break with precision. Had an excellent Senior season averaging 22 ppg on his way to 1st Team All-Region honors. Nice prospect. Strong and athletic wing guard who had a very good camp. Tough matchup for opposing defenses. He can put ball on the floor and attack rim, post up on block, and knock down the three ball. He is good in transition, runs floor well, and can finish above the rim with authority. Underrated talent who will be great pick up for school at next level. 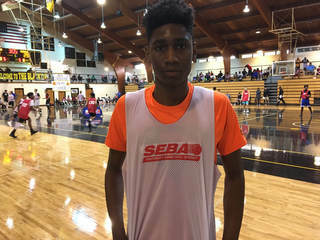 A pleasant surprise, Michael caught the eye of coaches and evaluators with his length, high motor and leaping ability around the rim. He was a monster on the boards and had several impressive dunks in traffic over taller players. Runs the floor well and is very active defensively. Carries a 3.9 GPA and 1290 SAT, which makes him a very promising prospect for higher academic programs seeking an athletic wing-forward. Named the Northwest Georgia Player of the Year this season after averaging 23 ppg, Wil is a highly skilled scoring guard who impressed with his playmaking abilities. He has good range on his three point shot and a quick release. Has burst to attack the defense and kick out to teammates for clean looks. Looked good in transition and leading break. Above average rebounder for a guard. Anticipates well on defense and picked up numerous teals in passing lanes. A highly athletic and strongly built wing, he used his speed, frame, and leaping ability to score in bunches. He is very fast up and down the floor and is a very effective in transition; often initiating the break off his own rebounds. He is very effective driving baseline and powering thru contact. Scored a good share of points on offensive rebounds and put backs. Was named 1st Team All-Region for the second consecutive season, averaging just under 20 ppg. Left handed guard with a very quick first step, Josh is a player who can just flat out score the basketball. Demonstrating a combination of pull-ups, runners, acrobatic drives, and three pointers, he scored at will throughout the day. Is the type of player who can routinely score twenty plus points while completely playing within the flow of the game. Has slender frame, but has wiry strength and long arms. Uses his body extremely well to fend off defenders and get off his shot. Averaged 23 ppg and was a 1st Team All-region selection while being named one of the top players in talent rich Cobb County this past season. 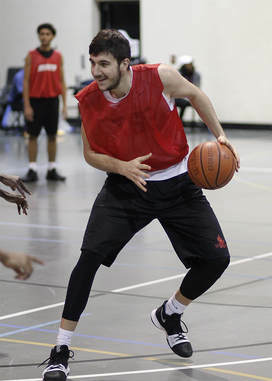 Native of Macedonia is an emerging big man with good potential. He showed solid body control and touch in the paint. Knocked down several face-up jumpers and was assertive on the both the offensive and defensive boards. Showed good awareness and understanding of the game. With continued development, he is going to be a nice interior presence at the college level. Good looking wing with better than average athleticism; Kiya does many things well on the court. Versatility is his greatest asset as a player. He showed the ability to knock down the jumper, slash to the rim, defend a variety of positions, while also making a heavy impact on the boards. One of the most well rounded players in camp. 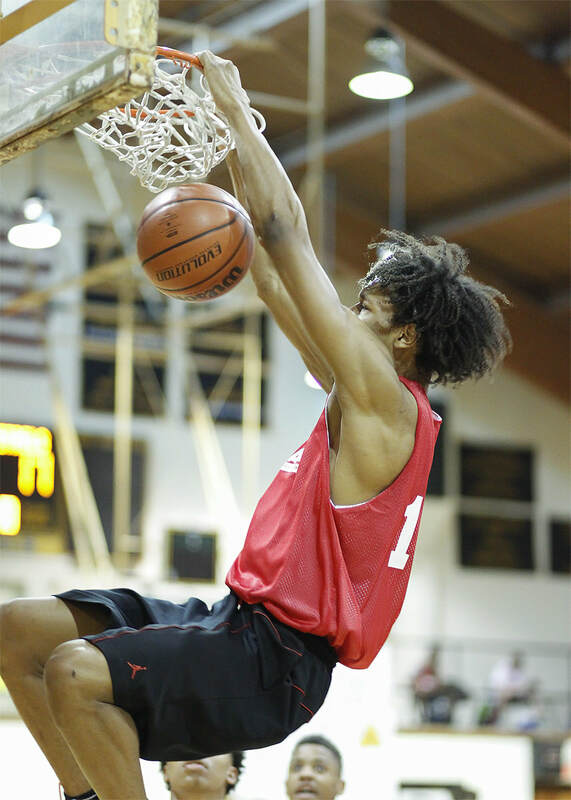 Athletic wing with good slashing ability and the strength to finish consistently at the rim. Demonstrated some nice bounce with several impressive dunks. He showed a solid mid-range jumper and willingness to bang in the paint for rebounds. After having to sit-out his Junior year due to transfer rules, He had a breakout Senior season where he was named 1st Team All-Region for the Warhawks. Is a player whose best ball is ahead of him. Strong interior presence who protects rim and snatches rebounds. Had a good share of blocks and shot alterations. While he is farther along defensively than offensively at this point in his development, he did show some nice moves around the rim and ability to finish strongly with a couple dunks. Averaged 14 ppg and 12 rebounds per game while being named All-Region this past year. Late blooming guard with size and diverse skill set; was making plays to positively impact his team on both ends of the floor. One of the state’s top rebounding guards this season, he was named All-Region in his one and only season of high school eligibility. Will be a nice pick-up for a Junior College program looking for a physical and versatile guard who can score and defend. 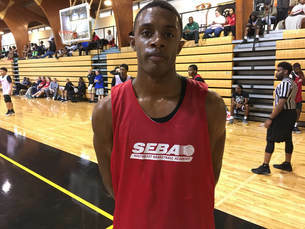 Skilled guard with good length and slashing ability; the North Georgia standout made a very positive impression as a scorer. He is at his best while attacking the rim. Has deceptive athleticism; impressed with his ability to finish in traffic and around the rim. Has a clean looking jumper which he knocked down consistently. Was a 1st Team All-Region selection this season and broke several school records, including most points in a game (with 43). Jones had a banner Senior season for Vidalia, earning All-State honors and leading the Indians to the Class 2A State Championship Game. He carried that momentum into the Showcase, where he electrified with his scoring and ability to shoot the three ball. He had a stretch in 5-on-5 play where he knocked down four consecutive treys….each one hitting nothing but net. In addition to his outside shooting prowess, his quickness allows him to get in lane and convert pull-ups and floaters over bigger players. Will be a great pickup for a program needing a scoring guard who is battle tested. Diverse skill set often presents a mismatch against opposing defenses. He has the size to post up smaller defenders in the paint and the quickness to drive past forwards off the dribble. He has good athleticism and plays well in transition. He is an active defender and crashes the offensive boards hard; creating many second chance opportunities for his team. Has a College ready game. Long guard prospect from Florida Panhandle with big upside; can shoot the lights out; one of the top three point marksman in the camp. Has deep range and quick release. Was able to create off the dribble very well and getting good separation from defense. He has a long wing span and is a good athlete. Has the potential to be a very nice College player. Speedy playmaker with excellent quickness and court vision; has the ball on a string and blows past opponents. Once in the paint, he uses his body well and is an excellent finisher. Showed a solid pull up jumper and gets good separation from defender. Draws defense and creates high percentage attempts for teammates. A two time All-Region selection, Nick was one of the top players in talent filled Gwinnett County this season. He is also a proven winner, having led Grayson to back-to-back “Final 4” appearances in Georgia’s largest classification (Class 7A). A PG who will help a school at next level win alot of games. The Camp roster boosted a deep pool of talented 2018 perimeter players who will play at the College level. In addition to the players already listed above, here are some others who also made their mark. Nayari Dampier (5’ 10, PG, North Cobb) impressed with his ability to orchestrate the offense and lead his team. Whether it was a well-timed assist, a knock down three pointer, or a big steal in passing lane, he consistently made plays to help his team win. 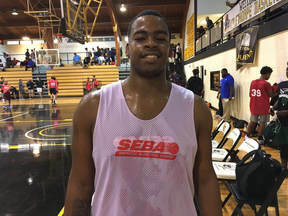 An All-Region selection this past year, the floor general generated interest among several Colleges in attendance. Tarrence Evans (6’ 2, CG, Eagles Landing) is a standout playmaker who can put points on the scoreboard. He is quick to the rim and a very good finisher around the basket. He is equally adept in creating his jump shot. 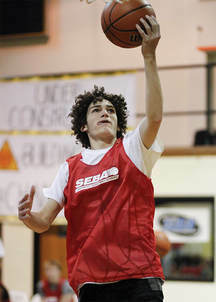 A career 1,000 point scorer, his talents will certainly be an asset for school at next level. Azan Alim (5’ 11, PG, McNair) was a pleasant surprise who really had a good showing. He is a quick and shifty guard who does a great job getting in lane and finishing. Is a very good set-up man who sees the floor really well and leads the fast break with precision. Savvon Delgado (5’ 10, PG, Kell) is a fun player to watch. He plays alot of confidence and has deep range on his shot. One of the best three point shooters in attendance, he also handles the ball well and can create off the bounce. Chan Ruach (6’ 3, SG, The Skill Factory) is a talented guard with length and good upside. Coming off a successful season on the Prep circuit with TSF, he displayed an accurate outside stroke and ability to put the ball on the floor. He gets up and down the floor well in transition, and had one of the camp’s top dunks on a fast break which sent a surge through the gym. Terrynce Jackson (5’ 11, PG, Stockbridge) is a super quick lead guard who can score the basketball in bunches. Whether it was his pull-up jumper or driving to the rim, he was in full attack mode. He also did fine job seeing the floor and distributing the ball to teammates in scoring position. Terrynce played a major role for tough Stockbridge squad that advanced to Elite 8 this past season. Jaylen Bussey (6’ 2, SG, Discovery) is a lights out shooter who knocked down treys at an impressive rate. He shot the ball extremely well from three point land, while also keeping the defense honest with drives into the paint. Nice prospect out of Gwinnett County. South Georgia product A.J. Pinkney (5’ 11, PG, Ware County) is a scoring playmaker who creates his jumper very well off dribble. 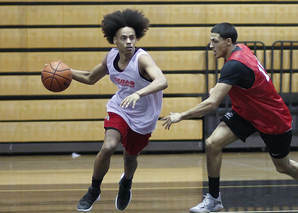 A scrappy defender, The All-Region selection wreaked havoc with his quickness, picking up numerous steals and deflections. Kameron Miller (5’ 8, PG, Sandy Creek) is a jet quick point guard who was an integral player for Sandy Creek squad that advanced to Final 4. His passing and defense abilities are special. As a distributor, he sees the floor very well and dishes for easy scores; while his on ball defense is stellar and capable of changing the course of the game. Rachid Shimou (6’ 3, SG, Piscataway, NJ) made the most of his trip down from New Jersey with an impressive showing throughout camp. He is a complete and balanced player who takes the ball to the rim strong. He is an active defender and one of the better rebounding guards in attendance. He also displayed a good basketball IQ and mature understanding of the game. Michael Evans (5’ 11, PG, The Skill Factory Prep) uses his excellent speed to lead the fast break and score in transition. The strong bodied lead guard has a effective pull-up jumper and knows how to score against bigger players in the paint. Daylan “DJ” Smith (6’ 0, PG, Duluth) is a battle tested and speedy guard who can help a program at the next level. He has a tight handle, is quick with the ball, and can penetrate to score or pass. He is also an active defender on ball and in the passing lanes. Terrence Taylor Jr. (6’ 4, SG, West Forsyth) is a skilled guard prospect with good size. He showed an impressive jumper off the catch and bounce. He was active defensively and on the boards. A 1st Team All-Region selection this past season, Terrence has a skill set that will be a nice asset to a school at next level. Joshua Archer (5’ 10, PG, Heritage) is a cat quick lead guard who impressed with his performance. He does a great job creating offense; possessing a dangerous pull up jumper and three point stroke. Plays with good toughness and competitive fire and isn’t afraid to do the little things to help his team win. 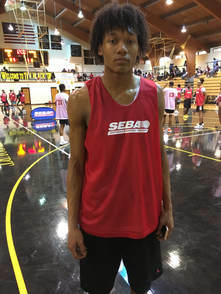 Markeevius Byrd (6’ 1, CG, Metter) is active guard who plays with a good motor. He looked good scoring the ball off penetration. A two time All-Region selection, his 3.8 GPA and 1130 SAT make him an attractive target for high academic schools to evaluate. 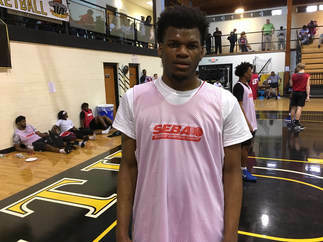 Christopher King (6’ 2, SG, Rockdale County) is a long guard who caught the attention of several evaluators with his intensity and ability to provide pressure defense on the ball. On the offensive side, he showed a balanced skill set and accurate three point shot. Zach Ledbetter (5’ 11, CG, Bowdon) is a skilled guard who impacts the game with his shooting and passing abilities. A career 1,000 point scorer at Bowdon, he plays with confidence and understanding of the game. He looked good knocking down treys and orchestrating the fast break as a ball handler. Christian Connor (6’ 3, CG, Parkview) is a diamond in the rough prospect with good potential. At 6’ 3 he has good size for a guard and is a versatile scorer. He has a good three point stroke and finishes well around the rim. Porter Law (6’ 0, PG, Calhoun) is an aggressive and physically tough floor general who does many of the little things to help his team win. He is extremely active on the defensive end, and is a first rate distributor. Porter broke Calhoun High’s all-time record for career assists while leading the program to a Region Championship this year. 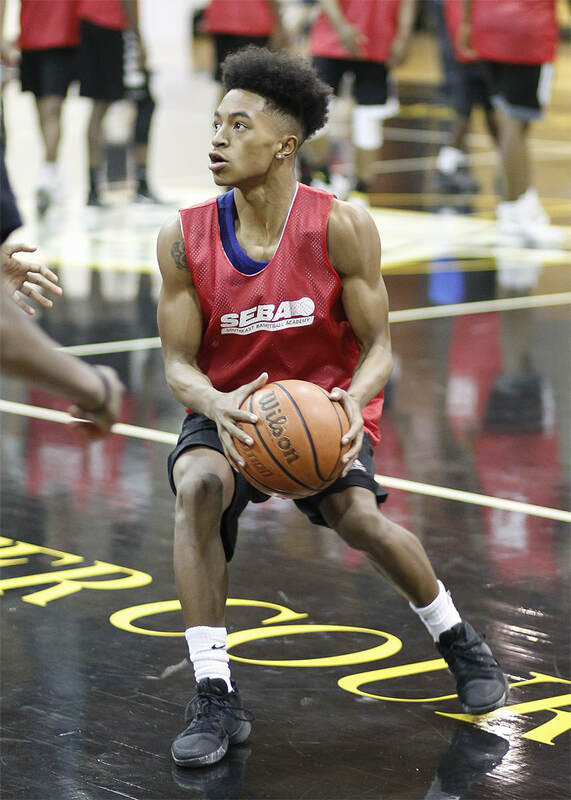 Trevino Jones Jr. (5’ 10, CG, Swainsboro) is a dangerous combo guard in the open court and beyond the three point line. The All-Region selection displayed great shooting ability, especially off the bounce. Defensively, he was locked-in and took pride in shutting down his man. 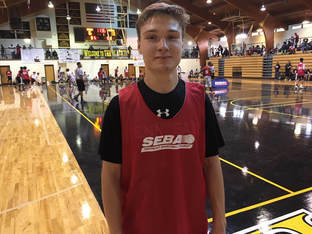 Alexander Ouellette (6’ 3, SG, Cumberland Christian) has attended several SEBA events since his sophomore season, and he has made strides each time we have seen him. He was one of the top outside marksman in camp; knocking down three pointers off the catch and bounce. His shooting ability combined with strong academic resume has brought interest from a number of coaches in attendance. Dustin Ladson (6’ 3, CG, Hillgrove) is a player with much upside potential. He has a strong and athletic frame and is explosive when attacking the rim. He guards the ball well and has the physical tools to be lock down defender at next level. Roscoe Spruill (5’ 8, PG, South Cobb) is a tough and compact lead guard with a lightning quick first step. He makes a heavy impact with his ability to penetrate defense and create for teammates. He did a very good job leading the fast break and making right decisions in pick n roll situations. 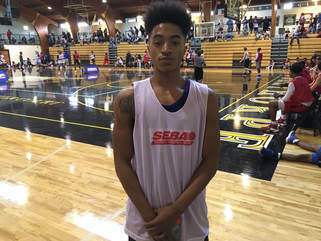 Sevin Brown (6’ 2, SG, Naples, FL) had a good showing as a well-rounded guard who can score and defend. 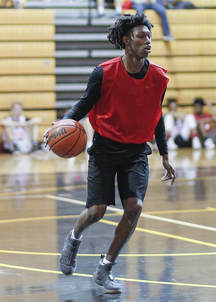 The Southwest Florida standout was effective in transition and in taking the ball to basket off penetration while also knocking down several three point attempts. Orry Owens (5’ 11, PG, Hillgrove; 2019) is a talented lead guard who had a breakout Junior season for perennial Class 7A State Playoff team Hillgrove. An All-Region selection, he has a great outside stroke, handle, and plays with a high basketball IQ. His on court talent combined with a 4.0 GPA make him an attractive prospect in the Class of 2019. Playing under the tutelage of legendary Georgia High School Coach James Lunsford, Malik Foston (6’ 1, PG, Georgia Military College Prep; 2019) is an athletic point guard who had a good showing. His first step is explosive and allowed him to turn the corner throughout the day when attacking the basket. He has a very good ‘stop and pop’ jumper in transition, and exhibited deep range on his three point shot. 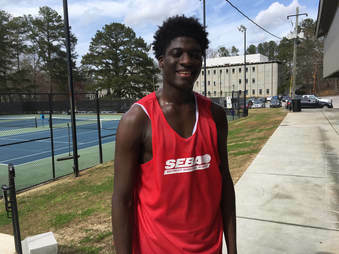 Nice prospect in Middle Georgia for Coaches to evaluate. Jervon Morris (6’ 3, CG, Paulding County; 2019) is a player with high upside potential. He has good quickness, length, and plays with a lot of energy. He is excels at creating his own jump shot and has that explosive first step to get into the lane. He was an All-Region selection and 17 ppg scorer as a Junior. 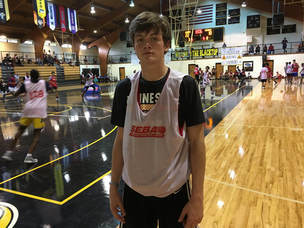 Clayton Johnson (6’ 3, SG, Chattooga; 2019) is a player to keep an eye on from North Georgia. He is a crafty and smart perimeter threat. His length allows him to finish consistently around the rim and he is effective in the open court. Jaylan Troutman (5’ 8, PG, Paideia; 2019) is a jet quick lead guard who is a good facilitator and strong on ball defender. He demonstrated good decision making and the ability to run a team from the point guard position. Alijah Huzzie (5’ 11, PG, Heard County; 2019 ) is an fast and multi-faceted playmaker who can drive, dish, and shoot. A two-time 1st Team All-Region player who averaged 22 ppg this year as a Junior, he excels in uptempo situations and on the break. Jaylyn Hickman (6’ 0, PG, Gatlinburg-Pittman, TN; 2019) is a dynamic lead guard out of the Knoxville area. His quickness and ball handling skills allow him to get to the rim with ease. He has a consistent outside stroke and good court vision. Averaged 23 ppg and 6 assists as a Junior and has already reached 1000 career points. Ryan Billig (6’ 0, SG, Pope; 2019) is a strong and athletic player with good body control. He has the ability to light it up from beyond the arc, slash to the rim, and plays much bigger than his size. Titus Brown (6’ 0, PG, Franklin County; 2020) is definitely a young guard to watch out of Northeast Georgia. He has a scorer’s mentality and good playmaking ability. He showed good quickness on both ends of the floor and did many things to put his team in position to win. Keondre Williams (6’ 2, SG, Metter; 2019) is a nice prospect with a good all-around game. He has good quickness, and explosive first step, and plays with a non-stop motor. 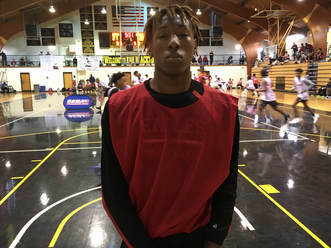 Charleston Willingham (6’ 0, SG, Woodville Tompkins; 2019) had a breakout Junior season for Class A power Woodville Tompkins, where he was named as the Region Player of Year. He continued that momentum into camp where used his big motor and athleticism to make an impression. He has a very quick first step and great slashing ability. He also knocked down a healthy share of outside jumpers. CJ Riley (6’ 1, CG, St. Francis; 2018) is a good looking guard who played an important role for Class A State finalist St. Francis this past season. The Junior guard is athletic and showed a very nice looking three point and mid-range shot. He is also a threat to attack the rim and once in the paint, he knows how to finish. Tay Howard (6’ 3, SG, East Jackson; 2019) is long guard with skill and versatility. A 1st Team All-Region selection this past season, he does many things well on both ends of the floor and is a 3.7 GPA student. Definite prospect for Coaches to put on their radar going into the Spring & Summer. Anthony Newsome (6’ 4, Wing, Stephenson; 2018) is a physical and strong framed wing who was effective from both mid-range and in the paint. He brings good energy and the ability to play lock down defense and crash the boards hard. Anthony was a 1st Team All-Region player for a Stephenson squad that won 20 games this year. 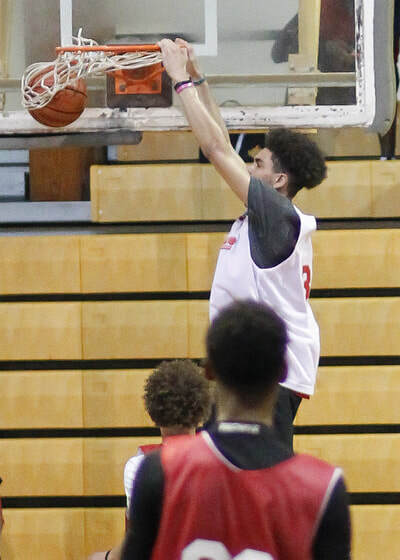 Jeremiah Sanabria (6’ 5, Wing-Forward, Allatoona; 2019) is a versatile forward who played his way onto the watch list of a number of schools at the camp. He can slash from the wing as well as bang in the paint. He has a solid face-up game and is a strong rebounder and interior defender. 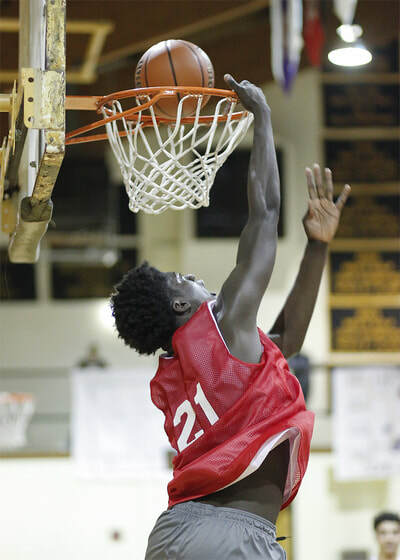 He demonstrated good athleticism with a couple of impressive above the rim finishes. Preston Crisp (6’ 4, Wing, Woodville-Tompkins; 2019) is a blooming prospect out of Savannah who had a very good Junior season. He uses his length and athleticism to his advantage while slicing to the rim for buckets. He is above average defender and rebounds well from the wing position. While still developing, the talent is there for him to be a special player. Isaac Hulin (6’ 3, Wing, Oglethorpe County; 2018) is a physical inside-out wing who is a tough rebounder and defender. A career 1000 point scorer, he is a very strong finisher in the paint and plays with purpose. He has a knack for being around the ball and creating second chance opportunities for his team. In addition to the Stockbridge players mentioned above, both Ocean Scott (6’ 2, Wing, Stockbridge; 2018) and Kaelon Hinton (6’ 4, Wing, Stockbridge; 2019) were two additional Tigers who had good showings. Hinton is good athlete who runs the floor well in transition and is a versatile defender. Scott is a ferocious competitor who plays much larger than his height. He is an excellent rebounder and major intangibles guy. He does a lot of things that don’t show up in the scorebook but help make a team successful. Ty Nails (6’ 5, Wing, Stephens County; 2019) is an athletic wing with a really bright future. “Finisher” is the first word that comes to mind when describing his game, as he showed the ability to score at the rim in both half court set and in transition. He also kept the defense honest by knocking down some long jumpers. Averaged 17 ppg and 8 boards on way to All-Region honors as a Junior. Christian Kelly (6’ 4, Wing, Duluth; 2018) is a long wing guard with a lot of talent. Although streaky, when he is focused and locked in, he is a tremendous offense threat capable of putting up big points in a short period of time. He is an excellent shooter off the dribble and has deep range on his three point shot. Will be a nice pickup for a Juco program needing perimeter scoring punch. Nikola Vuksanovic (7’ 1, Center, Rabun Gap; 2019) is European transfer student playing for Rabun Gap, a program that has developed multiple standout College forwards over the years. A prospect with obviously great size, Nikola’s production improved as the day went on and he became more comfortable in the camp setting. He has decent touch in the paint, good hands, and invited contact when powering to the rim. He recorded several blocks and was receptive to instruction in morning skill stations. Look for him to improve rapidly as he continues to get acclimated to ball here in the States. Adrian Hood (6’ 6, Forward, New Creation Christian Academy; 2018) is a forward with good instincts and a muscular frame. He had spurts of dominant play in the paint, where he pulled down rebounds and blocked shots. Has the ability to finish strong as evidenced with a couple of impressive dunks in traffic. While not yet a finished product, the potential is there for him to make a good impact at the next level. Deali Thompson (6’ 7, Forward, Grayson; 2018) is a Senior big man with a powerful 245 lbs. frame. Had a solid performance throughout camp. He provided solid rim protection and interior defense within 5-on-5 setting, and played with good hustle. He had several offensive put backs for scores and owned rebounds in the paint. Rising prospect Jamar Moore (6’ 6, Forward, Loganville; 2019) is a highly active forward who made his mark on both ends of the floor. Offensively, he scored on the block and while taking his man off the dribble from the wing. Defensively, he blocked/altered a good share of shots and rebounded the ball at a high rate. Was an All-Region selection this year as a Junior. Kendall Norrington (6’ 6, Forward, Mt. Zion; 2019) is a rising forward with a sturdy frame. He showed the ability to finish around the rim and knock down the face-up jumper. Plays well within a team concept and is an active help defender. Has good work ethic and is 2019 player Coaches will want to keep an eye on moving into the Spring and Summer circuit. Trent Gordon (6’ 6, Forward, Duluth; 2020) was an underclassman who caught attention with his play. He has a good motor, works hard for position, and has above average athleticism. He did not shy away from contact and was persistent on the boards. Will be a player to watch as he continues to develop under the Duluth coaching staff. Dylan Bohling (6’ 7, Forward, Etowah; 2018) is a long and developing big man whose best ball is ahead of him. He has good footwork and mobility for his size. A player with an excellent work ethic, he maintains a 3.97 GPA in the classroom. George Davey (6’ 8, Forward, Action Sports Academy Prep; 2018) is a promising forward who is effective on the block and out on the wing. He played well in pick-and-pop situations and has a nice turnaround jumper. Dished out some nice assists to cutters out of double team and had a good share of offensive put backs. Special Note: We want to extend sincere thanks to all of the High School and Travel Ball coaches throughout Georgia and the entire Southeast who supported this event. Additionally, we want to send a special thanks to Courtney Brooks (Whitefield Academy), Cabral Huff (Duluth), Virgil Amey (East Jackson), Antoine Stroud (Duluth), James Davis (ASA/Ball For Life Foundation), Aloysius Henry (Methodist University), Brian Fisher (3Strong), Tony Ellison (Tapestry Charter), Bradley Grayson (FCI Warriors), Dale Williams (Tampa Bay Bolts), Darin Cooper (Harrison), Chuck Melito, Travis Moore, Richard Kelly, Joshua Brooks, and Shawn Courtney for their time and efforts in working with the players; the Georgia Basketball Coaches Association (GABCA), and last but not least Head Coach Phil Ponder, Assistant Coach Zach Altany, and the entire Oglethorpe University Basketball program for their ongoing support.